Despite the season being well and truly over I’ve not spent much time considering what lessons can be learnt from it. 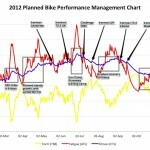 I scratched the surface in my review for Endurance Corner just considering the Performance Management Chart (PMC). I’d have left it there were it not for further questions on what to look for when examining training logs. The PMC is a good starting point, but there was more to be learnt by picking through the data in WKO. A familiar chart on these pages, though I’m not sure if 2010 has made it here in its entirety before. Rather than revisit specifics from the year (you can read that in the Endurance Corner column) I’m going to consider how I use this chart to assess training and what I can take forward from this. There are a few simple principles I can learn from the past year and use to help shape 2011. 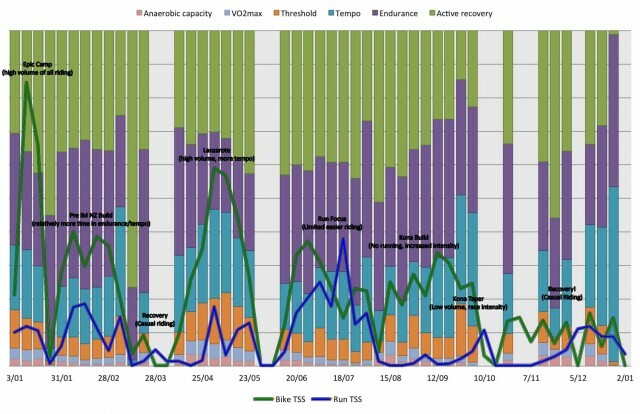 I particularly focus on Training Stress Balance (TSB) as a good indicator of periods of intense training and their impact on recovery. TSB drops as I apply increasing training loads, I expect to spend time with negative TSB whilst in a solid training block. Periods of negative TSB are a requirement of developing fitness, how they are managed is what maters. 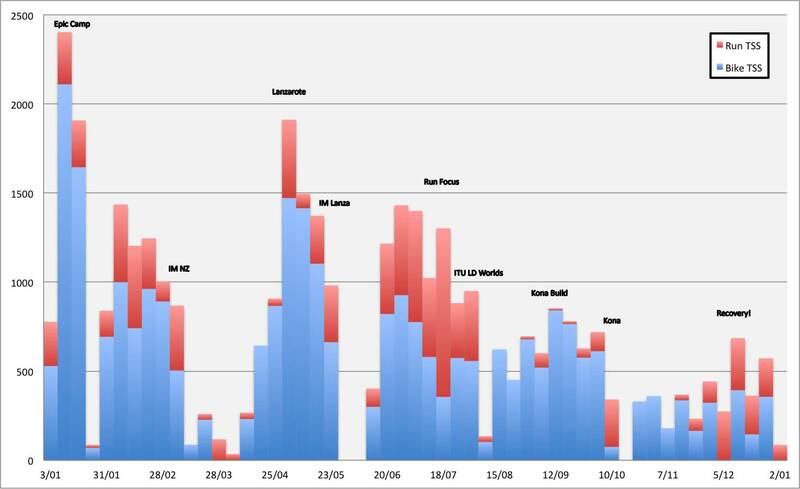 The further TSB dips or longer spent there the greater the impact on performance and recovery. TSB < -70: guarantees I’ll need a significant recovery period shortly after, often achieving TSBs as high as 50. TSB -70 – -50: has less impact on recovery in the short term, but longer periods likely require similar recovery to TSBs below -70. TSB -30 – 0: is typical of a good training block, recovery will be needed at points, but nothing of significant impact. TSB 0 – 10: gives more chance of a surprising performance in training. It’s a good place to be for challenging sessions or training races. TSB > 10: has generally worked well for races. Too high and whilst freshness makes me feel good, lost fitness will impact performance. In general a higher Chronic Training Load (CTL) can lead to a better performance, but the higher the number the greater the work to reach and sustain it. On a fulltime training schedule I could reach numbers that couldn’t be managed with more limited time, I had could do the work and importantly recover from it. Whilst high CTL is a good thing it’s hard to predict actual performance from it. On a limited schedule perhaps I’ll reach 110 rather than 150, but I’ve seen I can get good results at either point. It’s the process of building a higher CTL that counts, the training I perform to reach higher fitness and my ability to sustain this level (and progress beyond it). This leads to race performance so when tracking CTL I should consider what the rate of growth, plateaus and periods when it falls tell me. What lead to an unplanned decline, was it something I did in training? Had I spent too long at low TSB and been forced to break consistency? These are the questions I consider to help guide the season ahead. 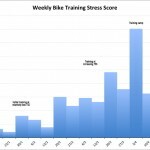 Looking deeper I can consider the training stress (TSS) for each sport over the year. Higher training stress leads to greater increases in fitness at the price of fatigue. High training stress quickly raises CTL and quickly drops TSB, too much or too fast and the fatigue is high. Weeks of exceptional TSS will likely lead to significant recovery and a period of much lower TSS. TSS > 1500: requires recovery in the following weeks, TSB is likely to have heavily dipped. TSS 900 – 1200: is sustainable as part of a serious build. A month in this region followed by a taper leads to a good race. TSS 700 – 1000: is manageable all year round on a sensible schedule, this is where the bulk of a longer build lies. TSS 400 – 700: an easier week during a build or a decent week back from a recovery period. TSS < 400: an easy week, casual sessions during recovery periods. Training stress is a product of duration and intensity, there’s only so far you can take either in a week. Higher TSS weeks require more time and are only realistically manageable in short blocks or on training camps. I know that 700-1000 TSS is an achievable weekly target that offers good returns in terms of fitness and recovery. As races approach I can consider a peak with an increase in weekly TSS towards 1200. There’s no harm planning occasional serious week so long as I’m prepared to follow with an easier recovery period. 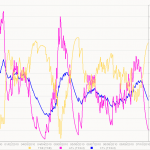 Breaking each week into the percentage of time in each of the Coggan Power Levels gives a more detailed look at my bike training. I’ve overlaid bike and run TSS to give an impression of the workload involved at the time. Not racing with power unfortunately means some data is missing (along with a couple of weeks of flat batteries!) Previous charts considered the impact of training on fitness and fatigue, this is about the composition. Much of the year is spent with roughly similar distributions of zones. When I wasn’t focussing on the bike (June/July) or training volume was high (January/February) lower power zones dominate. During more bike focussed blocks there’s a shift towards slightly higher levels with a progressive increase of work in tempo and threshold. I consistently spend a small proportion of time above my threshold. 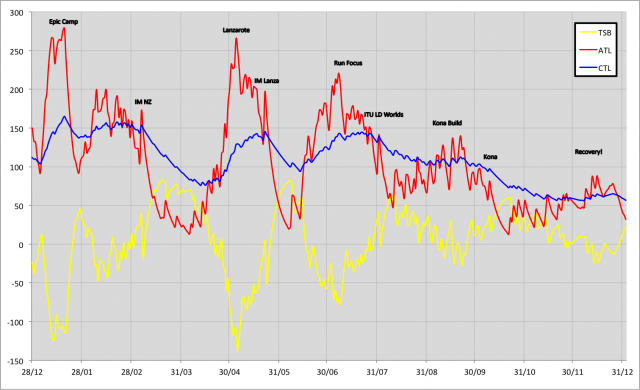 Largely through choice ride time will be more limited in 2011, this naturally shifts my approach to bike training. Training stress will drop, but I can control the reduction by increasing intensity. At lower volumes I’m in a better position to recover from each session and perform the next well. My ability to ride far is established, but my ability to ride hard could use more work. Managing the composition of bike (or run) training helps minimise the impact of reduced volume and allows a focus on specific aspects of fitness. I picked the charts above because they tell me about how much I trained and what I did with the time. I can then this back to the PMC and see the impact it had in terms of fatigue, recovery and performance. Planning the season ahead I consider what delivered a good level of CTL, enable consistency by avoiding fatigue and contained the right balance of intensity for my goals. The result is a set of principles to help guide me. CTL around 110 – 120 is a good level to race at. TSB below -50 should be avoided except on training camps. Composition of power training should increase emphasis on Threshold and Tempo at a reduced volume. The most important lesson from 2010 though is sometimes it’s easy to focus on the numbers, the heart rate, power, fitness or training stress. Record the data, plan sessions, set goals, but most of all enjoy the process. Training should always be fun.